So when you buy a TeamMoto Approved Used Bike you can be sure that the motorcycle is genuine in terms of its history, that it has been prepared for sale to a clearly defined standard and that it represents excellent value for money. Our Approved Used Bike program has been developed to make buying a used bike easier, and most of all: a genuinely pleasurable experience! 2-Day Free Exchange - A second chance to get it right within 48-hours of your purchase. 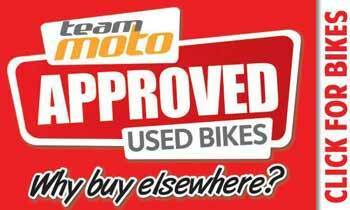 It's that simple, you just choose another TeamMoto Approved Used Bike of the same value. 49-Point Visual Safety Inspection – All approved used bikes undergo a comprehensive 49-point Visual Safety Inspection alongside their safety certificate where applicable. 90-Day MPP Extension - Did you know: it is not required by law to provide a warranty when selling a used motorcycle in the state of Queensland? No need to worry though, every TeamMoto Approved Used Bike comes with a 90-Day Mechanical Protection Plan extension for FREE when you purchase a 1, 2 or 3 year Mechanical Protection Plan.